The constellation of Cepheus contains many dusty gems including the Dark Shark Nebula,LDN 1235 an extended red emission nebula, LDN 1251, a dark nebula, and vdb 152, a dusty region condensing to form protostars. 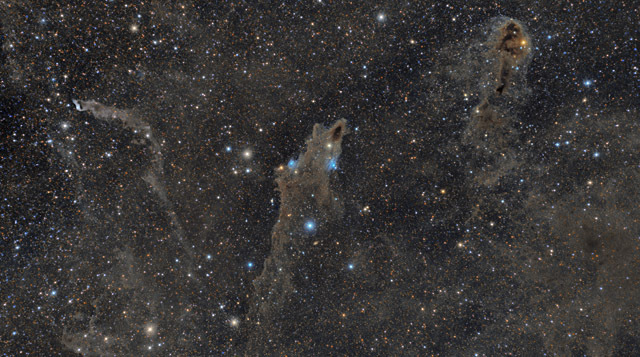 This image shows the large extent of dust in a 7 2/3 by 4 1/4 degree region of Cepheus. The image is cropped to 73% of its original size. In this image, North is to the right. Date November 14, 2014, August 13 and August 15, 2015 for base images. Software Used Images Plus 5.75 for camera control, calibration, and stacking. Images Plus 6.0.5 for DDP stretching and ArcSinH stretching, star size reduction, smoothing and noise reduction, feature mask, and color channel splitting and recombination. Photoshop CS5 used for levels and curves, screen mask invert, high pass filter, lab color, saturation adjustments, selective color, and match color. Gradient Xterminator for gradient removal. Carboni Tools for additional noise reduction and smoothing. HLVG for additional color correction. Registar 64 for subexposure alignment and color channel alignment. Pixinsight 1.8 for automatic background extraction, color calibration, histogram transformation, star mask generation, median transformation, and morphological transformation. Notes This astrophoto is a composite image using a 200mm lens to capture the breadth of the field of view. For each of the main nebulae in the image, the details were enhanced by blending in data captured with a 600mm lens. In this way, the image shows the larger field of view with improved resolution in the primary nebulae contained within the astrophoto. As with many of these dusty regions, the image was very challenging to process, as it's very difficult to bring out the faint nebulosity without overwhelming the image with a plethora of stars. I tried a number of recently learned techniques to process this image, and I'm overall pretty pleased with the final result. I originally started this image in 2014, but much of the data I collected suffered from some problems introduced with my newly acquired Nikon lens. While the final image includes a total of 54 hours of data, I actually had to toss an additional 36 hours of data! As such, I have over 90 hours of imaging time invested in producing this final result. I figure its about time to move on to another constellation!